September 9th was like Christmas for “i” lovers everywhere. 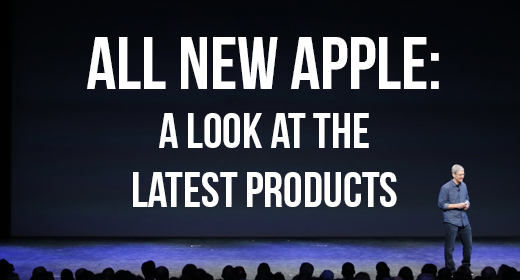 New products were announced at the Flint Center in Cupertino, California and like all of Apple’s major releases, it was a show stopper. (Or should I say work stopper?) Let’s get to it because there is plenty to cover. Two new iPhones were introduced: the iPhone 6 and the iPhone 6 Plus. Apple CEO Tim Cook described them as “the biggest advancement in iPhone,” and I would have to agree. Using previous models of the iPhone as a standard, those are some hard shoes to fill. Both models will be thinner than a Galaxy S5 and both will be sporting retina displays. Landscape mode has been updated, and will also work on the home screen. Each phone will be housing an Apple A8 64-bit processor, which is pretty sporty! This will make the new phones 50% faster than the older models and 25% faster than the Galaxy S5. Along with a updated core processor, the phones will be utilizing an M8 Motion Co-Processor. Wi-Fi is three times faster than the 5S and supports voice over LTE. The 8-megapixel iSight camera gets a new sensor and focus pixels, which read the light coming in and out for the same fast autofocus found on high-speed DLR cameras. With these advancements, the new camera supports 1080p video at 60 frames per second. Users can also capture slo-mo videos up to 240 frames per second. Colors available will be Gold, Silver and Space Grey. The iPhone 6 will have a 4.7-inch display. That’s a pretty big deal for iPhone fans! As for the 4.7-inch screen size, this will place the phone just smaller than a Galaxy S5, which I think is a good size for a typical phone. The iPhone 6 starts at $199 for the 16 GB model, $299 for a 64 GB model and $399 for a new 128 GB model. The iPhone 6 Plus will have a 5.5-inch display, which puts it just smaller than the Galaxy Note line. The iPhone 6 Plus starts at $299, going all the way to $499. Given all of the specs listed above, I could write an article outlining each new element. But instead, let me cover the high points that make the new generation iPhone special and, hopefully, how it got that way. Actually, the bulk of the credit for this new phone goes to the processor. The new A8 is built on a 20nm platform. While not cutting edge by any stretch, it will still give the new line some very strong longevity in a crowded market. The new processor contains twice as many transistors as the previous A7, but it’s 13% smaller! The A8 is a dual-core processor operating at a maximum of 1.4GHz. Notice that I said “maximum”? The processor can throttle its clock up and down based on the amount of work the user places on it. This is also why the user will experience much better battery life out of their device. Again, not cutting edge, but this A8 is not a schmuck by any stretch, and Android users will probably not see this same level of processing power in a phone at this price point until next year sometime. Outside of the disappointment some might feel by the new line not being shipped with Sapphire Glass for the display, there is not a lot here to complain about. Using UV light to align the crystals of the display gives a much sharper image, darker blacks and brighter whites, and is a better polarizer, which helps when viewing the phone with sunglasses. Top that off with dual-domain pixels, which makes viewing movies and photos even better. Plus, being able to use your phone in landscape mode even from the home screen is pretty cool. And it’s Retina, so enough said. Apple’s highly anticipated payment system, as reported in earlier leaks, will leverage near-field communication (NFC), which is a new technology for Apple. Because of this, Apple Pay will not be available for older iPhones. The new phones will take advantage of a chip called “the Secure Element” to store encrypted payment information. All credit cards will appear on Passbook and no credit card numbers will remain on the phones. This works pretty much the same way as Stripe, which is very nice. Thousands of developers, myself included, are huge fans of Stripe, so rest assured that it’s a proven system. Visa, Mastercard and American Express are on board to accept payments through the new system, and so are several banks (including Bank of America and Chase). Apple Pay will also be enabled with apps such as Target, Groupon and Uber, as well as other retailers including McDonald’s, Nike, Subway and Whole Foods. This level of support right out of the gate should give the service a nice leg up when it launches this October. Sadly, it was just announced that two of the largest retail outlets here in the states will not support Apple Pay for now: Wal-mart and Best Buy have announced that they are backing a retailer-owned mobile technology company called MCX. We will have to keep an eye on this story as it develops. Possibly the most anticipated item to launch was the Apple Watch. Touted as “the most personal device we’ve ever created,” it has possibly had more specs leaked than any other product and has had speculation that rivals the existence of aliens. The watch bands come in various colors: ink, blue and white. The device includes a digital crown that translates analog movements into digital commands. It scrolls lists, zooms in and out, navigates to the home screen, supports voice controls through the use of Siri, and boasts an accelerometer, gyroscopes and sensors to check your pulse for fitness apps. It can also leverage GPS and Wi-Fi from the user’s phone. The watch will have a sapphire retina display, and it will be available in two sizes and six band types. It doesn’t seem to be as bulky as some Android-based wearables, such as the Moto360, which is just a beast of a watch. Users will be able to customize the face or home screen, and it supports touch as well as using the crown to navigate. It seems as though the watch can be tied pretty tightly to your new iPhone 6 through notifications and being able to quickly respond to messages. The Starwood Hotels app lets guests use their watch as a room key, while Twitter users can view their timelines or send tweets from their wrists. BMW, Pinterest, Honeywell, Nike and Major League Baseball are all working on watch apps. Pouring over all of the specs, I think the new iPhone is a solid performer. It’s an iPhone after all, so we can feel certain that it is going to work, and work very well. Delivering this level of phone at this price point is pretty unheard of, especially for Apple who is known for its over-priced hardware. Personally, I think the new line and watch are a step in the right direction even though none of the items launched at this announcement were groundbreaking. But if the direction they’re heading stays the same, I cannot wait to see what they launch next. The rumor mill is abuzz about Dell’s 5x monitor and how iOS8 has settings that match the resolutions needed for it, so that’s something to think about. Don’t miss the latest episode of the podcast; it’s all about Apple! I’m at a fork in the road. I’ve had my 4S for 3 yrs. Ready for a change and don’t know if I want a 6 plus or go to the android side of the force. @Eric What it all boils down to, for me anyway, is “ecosystem”. Which ecosystem do you like best. There is nothing wrong with really any of the three ecosystems on the market today (Windows, iOS and Android). It all depends on which one fits your life the best. I see a value in all of them, but again, it’s a very personal thing. How much is the 64gb one again? Excited but probably won’t spring for it.